Remembrance Day 2012-We Will Never Forget. Remembrance Day in Canada falls on November 11th every year. Known as Veterans Day in the USA, Remembrance Day began in 1919 as a way to commemorate the armistice at the end of the First World War, which took place a year earlier. Since that time, on the 11th hour, of the 11th day of the 11th month every year, we pause to remember all of those who have given their lives so that we may live in peace and freedom. 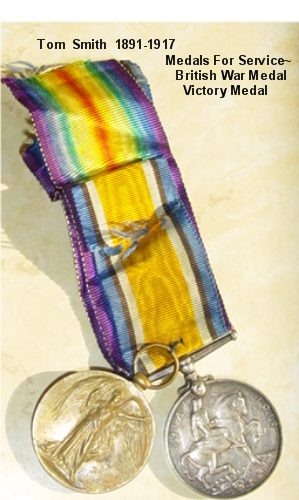 More than 66,000 Canadians died in the First World War. In the Second World War, 46,998 men and women lost their lives, never to return to their loved ones. Since the Second World War, Canada has lost 794 more military personnel, not only during times of strife, but also on peacekeeping duty. As we go about our daily lives, we often take for granted the sacrifice they have given. We cannot even begin to imagine the horror and sorrow they were subjected to in the final hours of their lives. This Remembrance Day, let us pause in silence once more and say a prayer for all of those who are no longer with us. 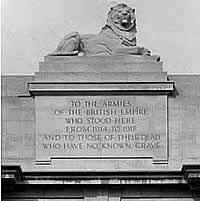 I post the following memorial for my Great-Uncle Tom Smith every year around this time, so that I and all who read it may remember not only him, but all of those who gave their lives. It is a reminder to us that these were men and women who were not only numbers, but real people. Peopel who loved, lived and were loved and remembered to this day by those they left behind. The thousands of miles that separated Thomas Smith from his family and home in the North Bay area of Ontario, Canada, disappeared in his final hours as he recalled his rocky Canadian shield home and the barren landscape of felled forests and clear lakes. What he would give for one more day to be back home cutting trees as a lumberman rather than dying here in the waste deep mud and wet cold in the battle for Passchendaele, Belgium. The end was so close, on Tom's last day, so close and yet so far. 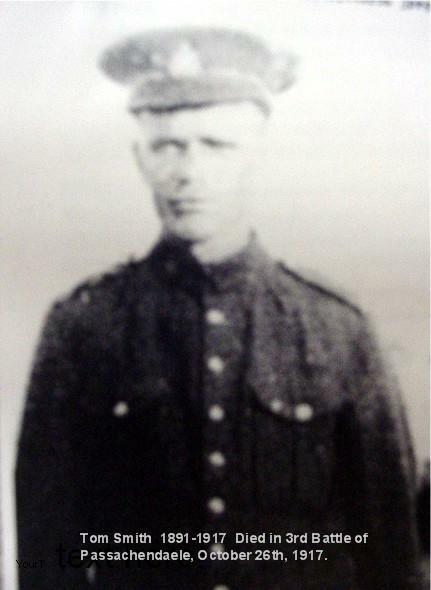 Tom, my Grannyda's Uncle, died in that mud, better known as the 'slough of despond', on October 26th, 1917. Barely 11 days later the battle was won. 'If only he could have hung on a bit longer', we voice our thoughts as we shake our heads sadly. 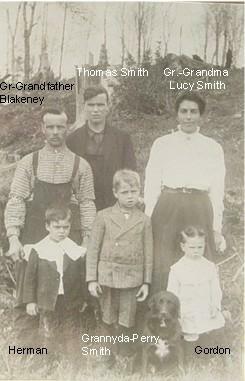 He left behind no children; only the families of his siblings and his closest brother, Blakeney Smith, my Great-Grandfather. Today, as we remember, our hearts are sad for you and the thousands of your compatriots who died for the same cause, Tom. We keep your memory safe with us and have not forgotten you, nor the sacrifice you made so that we, your descendants, might live in peace and security. If you are able to look down upon us now and hear the conversations of the family who still feels a heavy heart over your death, you will have seen the narrowing of my Father's and my eyes this morning, as we sat remembering in a quiet kitchen while drinking tea and gazing upon all that we have left of you. You would have seen our heads downcast in sorrow as we talked of your height of 5'11 1/2" and how you were tall and strong and had the blue eyes of your family who came before you. You would have heard my Father exclaim once more, while holding old documents in hand, 'such a tragedy and loss of so many young men and all so far from home.' You would have heard us discuss your grave in Flander's Fields and the memorial there with your name on it. Still so far from home. You will know, that we who hold your memory strong, hold your medals up to the light and read your name finely engraved on the outside edges, as a feeling of sorrowful pride envelops our hearts and we remember once more, that these were earned , by you. Of course, we have all of your particulars in government issued, official looking documents, duly stamped and signed, that describe your appearance down to the finest detail and where you were stationed and when you arrived and when of course, you died. The 'human' element is missing though. What made you, you. What made you smile, what songs you enjoyed on Sunday evenings after dinner with the rest of the Smith clan in those northern woods you called home. We know not of your dreams that you held close to your heart or if there was someone back home that you held a candle for in the depths of your being. Those stories were not recorded by government issued documents. It was only your body and mind they wanted, and this was evidenced in the line of one document where you were 'taken for strength' to fight the next mission as your military history moved forward in fine penmanship on a frail, old paper that we keep safe. We sit in kitchens and surmise as we gaze upon the seriousness and determination of your handsome young face, and in our hearts we know, that not only did you do good, you did good for all of us. We will remember you Thomas Smith, always. If, in your final hours, the old phrase of your Irish ancestors, 'my hope is strong in thee', crossed your mind while you lay in the cold and mud so far from home, know that your final thoughts sent on a trajectory of time, were received by us and they will live on. What you fought and gave your life for, your hope for peace and the security of future generations that was etched upon your soul, is strong in us, Tom Smith. Your unspoken thoughts in your final hours, your hope, will live on through us and the successes you died for, will always remain. We will remember you , Thomas Smith, we will always remember. Son of William Smith, of Teeswater, Ontario. Bedazzled. And All it Took Was One Man, Some Rocks and Gravity. Olympics Starting in Vancouver, BC, Canada Now! A Story About a House, a Ring and Love.